On October 5, I met former U.S. President Barack Obama at a private meeting at the Hilton Hotel, in São Paulo, Brazil. Days before the event, I received an invitation from the Obama Foundation to a meeting and a questionnaire about my professional profile and community work. The message did not provide details about the event, and I had no idea that Obama himself would be present. Days later, I received the schedule of the event and the confirmation of his presence, which was an incredible surprise. The kind of thing you feel like sharing with family and friends, but the recommendation was straightforward: only disclose information after it is authorized by the foundation. For security reasons, the meeting was disclosed to the public 24 hours before the event, and any contact with the press had to be mediated by the Obama Foundation. The purpose of the historic meeting was to enable the president to hear from 11 young leaders from the social field on the challenges of current issues and how the new foundation of the former president can operate in the world. The days before the meeting were days of expectation and reflection: What should I talk about? How did the selection happen? How to summarize into a few minutes everything that Obama represents to the Brazilian black community? Finally, the big day arrived and, with it, the expectation only increased. Upon entering the room, another surprise: I would sit right next to Obama!A movie went through my head, like a flashback of my entire career, the place where I was born (in one of the most impoverished areas of Salvador), the people who encouraged me and, above all, the unanswered question of how my dear father (in memoriam) would have received this information.That was not an achievement of my own, but a collective one… The butterflies in my stomach only increased. If it were not for the support of my partner, Keila Costa, I would have been even more nervous. I was the only Brazilian northeasterner at the meeting. But in the first few minutes of the meeting, my mind grew calmer. It is not by chance that Obama is recognized for his charisma. Symbolically, as he greeted us and took off his jacket, he made us comfortable and showed that he was one of us. The proposal of the meeting: to get to know our initiatives, projects, hear contributions and demands for the Obama Foundation and, above all, show that it is increasingly necessary to empower communities to develop their solutions and innovations. Such proposal represents everything I believe in: communities have solutions and great potential to improve their realities, but they need opportunities. 1. I talked about the number of black people in Brazil. 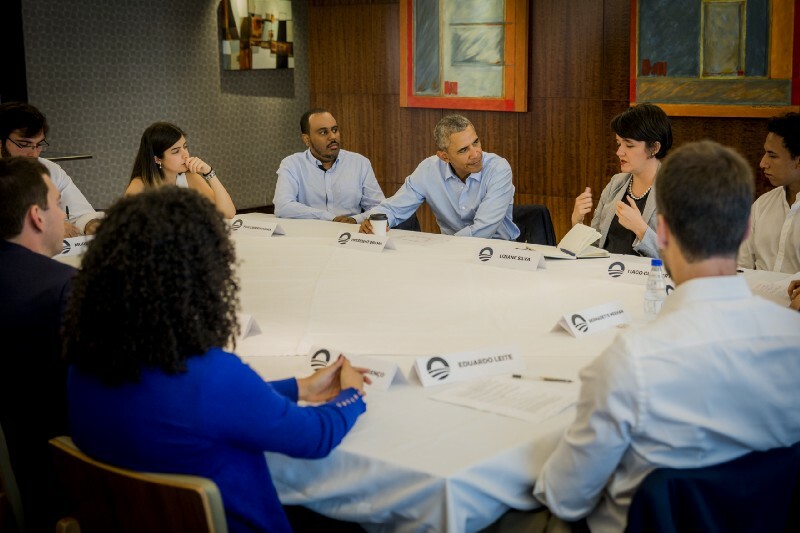 I told President Obama that we are 100 million Afro-Brazilians, but that we are still invisible in the media, in the economy, and in politics. I mentioned that we are more than 50% of the population of Brazil, but that black women are less than 1% of CEOs and blacks are 70% of the Brazilian poor. I commented that his coming to São Paulo in 2017 was comparable to me going to Alabama in the 60’s, given the racial and gender inequality. 2. I talked about violence against young people. I told him that there are about 60,000 people killed every year, mostly young people, in Brazil. That it would be interesting to bring to Brazil the important initiative created by his administration called My BROTHER’S KEEPER, which aims to support young blacks, the greatest victims of police violence and the drug war. 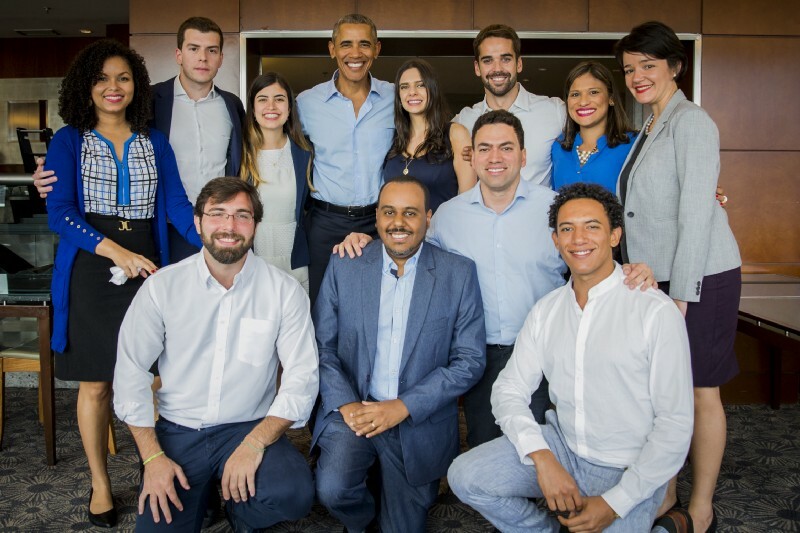 This will be one of the priorities of the Obama Foundation, and he found it interesting to make this connection with Brazil, one of the countries with the highest rate of violence in the world. 3. I told Obama that African descendants do not have a voice in the media. I said that, in Brazil, there is no tradition of black media and there are no TVs, radios or newspapers with significant circulation covering black topics. I told him that we rely solely on the power of the Internet, which has helped to make room for new political voices. He recalled that, in the U.S., they have TV channels such as BET (Black Entertainment Television), founded in the 1980s by a black businessman. 4. I suggested that he worked on connecting the black community of the U.S. more closely with Brazil’s. I teased him that he should bring his influential friends here, such as media entrepreneur Oprah Winfrey, owner of the cable channel OWN. I gave him the example of the founder of the website TheGrio.com, David Wilson, who just moved to Brazil to create media ventures connecting Afro-Brazilians and African Americans. I said that more diversity was good for all Brazilians, especially from an economic point of view. 5. I invited the president to visit Salvador, Bahia. I told Obama that the next time he comes to Brazil, he should go to Salvador(Bahia), the country’s cultural and black capital. I assured him he would be impressed by the city. He smiled, and although he did not confirm, I believe there is an excellent opportunity for a future visit to the most representative city of Afro culture in South America. 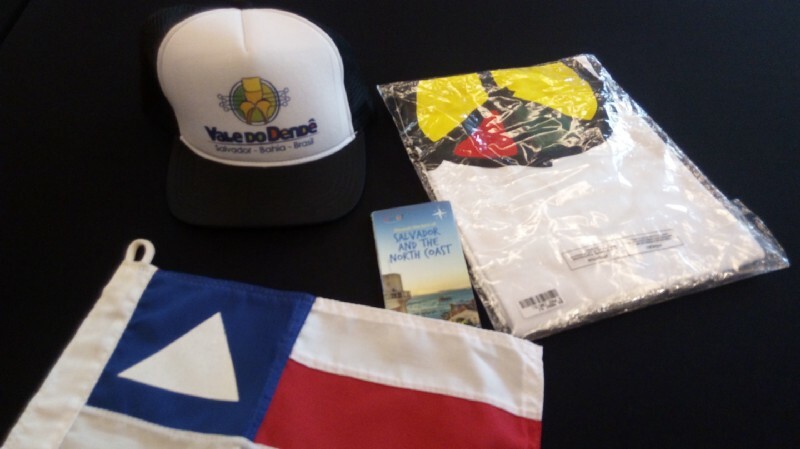 To “reinforce the invitation,” I left him with a kit containing the flag of Brazilian state of Bahia, the map of the city of Salvador, an Olodum Afro-Brazilian Cultural Group T-shirt, and a Vale do Dendê baseball cap -our creative business accelerator that aims to empower young people from the impoverished outskirts to grow their ventures. Finally, Obama invited us to informally contribute ideas for the functioning of the Foundation, which should go into full operation within 1 year. The foundation’s focus will be on civic engagement and support for community leaders around the world. It really was a historical and exciting day! P.S. : Thanks to all the friends, family, and mentors who helped me reach this moment. My colleagues at the Correio Nagô’s Ethnic Media Institute (Instituto Mídia Étnica), in particular, the Casé Assessoria, and especially Fabiana Oliva and Patricia Casé, for their support and assistance with the press. Click on the media names to read some news articles on Estadão, Globonews, A Tarde, Folha, Correio Nagô, and watch the official video on Barack Obama’swebsite. Paulo Rogério Nunes is an entrepreneur, co-founder of the Vale do Dendê Accelerator, diversity consultant, speaker at Casé Fala, and affiliated with the Berkman Klein Center at Harvard University. English Version by Melissa Harkin.